A project designed to raise funds through the sale of specially designed 9/11 Tribute Uniform Patches, 9/11 Decals, Pins and Flags. It is also about honoring the heroes of 9/11, creating unity among Fire, EMS, Police and U.S. Military and keeping the memory of 9/11 alive. To date, there are over 6000 organizations participating in 22 countries. Currently, the 9/11 Patch Project is working on donating the 9-11 Memorial Patches to all 11,000 FDNY Firefighters, Please contact us if you are interested in helping. Founder and owner of 9/11 Patch Project created December of 2001 to remember the heroes of 9/11. Funds raised though the sale of special 9/11 Tribute Patches & Decals. 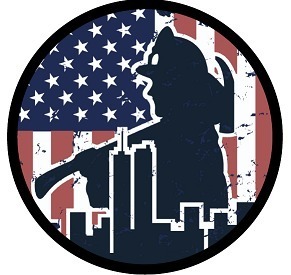 Sales are generated from the sale of 9/11 themed merchandise (patches, decals, challenge coins, paracord bracelets, stuffed animals and 9-11 Tribute Shields and Helmets. Additionally, we have held fundraisers such as the 10 Yr 9-11 Manhattan to Manhattan Bus Tour and the Fully Involved Comedy Tour with comedian Ralphie May. We have 12 years traction running the largest, longest running and farthest reaching firefighter-owned 9-11 Project in the world. Our designs are considered iconic and used by over 10,000 organizations in 30 countries.